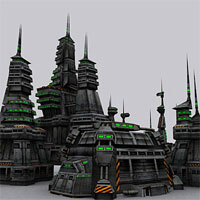 The Interplanetary trade center is an assembly point for foreign merchants, ready to trade with you. The maximal level of this building is level 7. With the upper levels of this building its capacity increases and there is room for more merchants. Because of the competition, they are forced to give you better offers. ОThis building provides you with flexibility with your resources. It allows you to exchange one resource for another according your needs. As higher the building level is, better the rates are. The highest level 7 grants you access to the Galactic ship market. In some universes you cannot trade gas to other resources or you can do it at different initial rates.